It may seem strange that Eric D. Sewell (informant) didn't seem to know his grandmother's name (Elizabeth Charlotte Monypenny); but Uncle Eric was under a lot of stress and likely had a momentary lapse of memory. 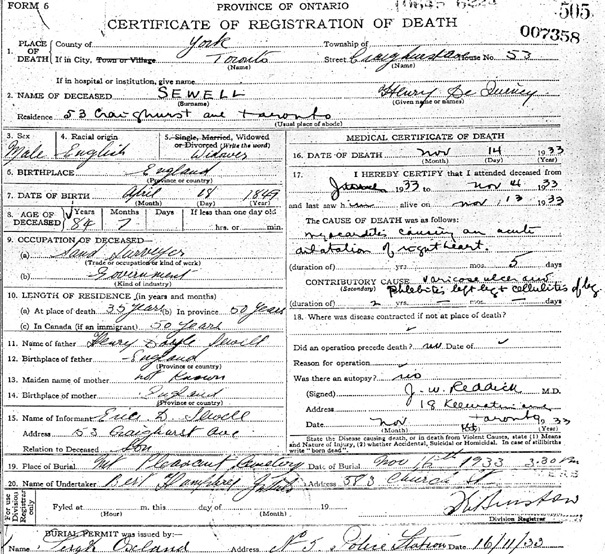 As well, he shows his grandfather Henry Doyle Sewell as being born in England when he was born in Quebec City. Something similar happened to me when registering my mother's death; I said her maiden name was "Furse." I was thinking of my grandmother at the time. The cause of death was "myacarditis causing an acute dilation of the right heart" with the contributory cause being "varicose ulcer and phlebitis left leg & cellulitis of leg." This is in keeping with a recollection by his grandson Robert George Sewell that Henry had some sort of ulcer or infection in one of his legs.